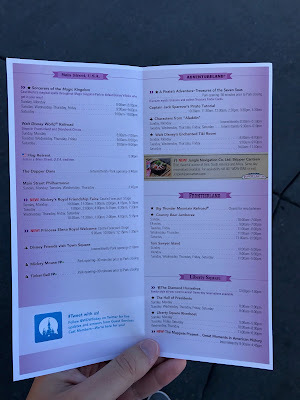 Guide4WDW.com: Disney Redesigns Times Guides at Magic Kingdom... More Parks to Come? Disney Redesigns Times Guides at Magic Kingdom... More Parks to Come? If you've ever been to a Disney park than you have inevitably picked up a times guide for that particular visit. For years, these guides were a simple document with times for certain events and shows throughout the day. The times fluctuate on a weekly basis and the pamphlets make touring the parks much simpler and more enjoyable. However, recently those pamphlets were redesigned, and it appears that the redesign is for the better. 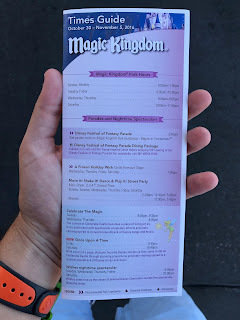 The new guides are fold out pamphlets with lists similar to what was available in the past. The big difference is that the guide is now much easier to understand for first time guests and many returning guests. 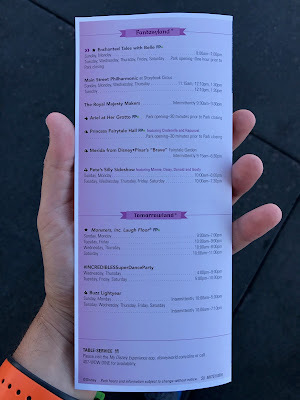 The redesign features larger text, a breakdown of times for particular events throughout the day by land, and a more detailed and colorful appearance. For many, the change over to listing events by the land in which they take place should make finding particular experiences quite a bit easier. Because, as many of us know all too well, every minute counts when you're enjoying the happiest place on earth! While this is not a big change, it should make things easier for a variety of guests in the future. We have yet to confirm if the new time guides will show up in other parks as well, but I would imagine they will roll out soon as long as the changes are received well at Magic Kingdom. Curious what they look like? Here you go! What Would Walt Disney Think of Today’s Parks? The Jingle Cruise Begins it's Holiday Run Today!